Campsite Quattro Stagioni is a campsite with 50 touring pitches and 120 year round pitches. 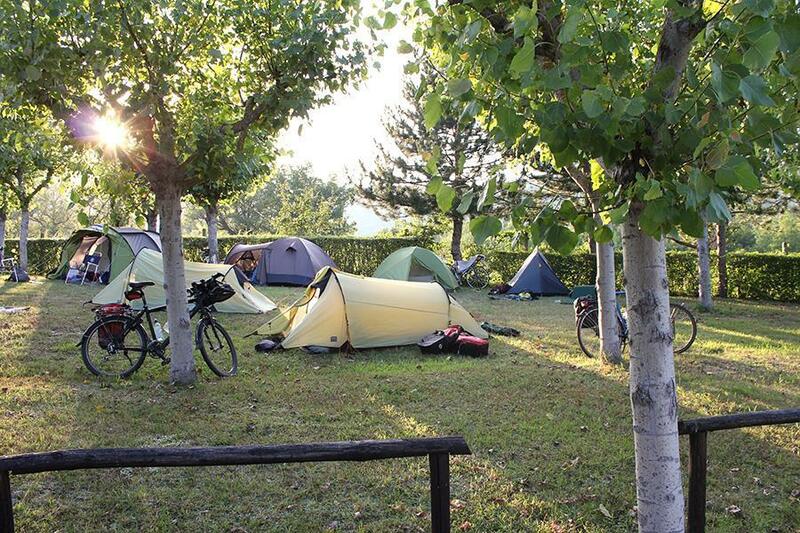 During low season, between 01-04-2019 - 15-07-2019 and 01-09-2019 - 30-09-2019, the nightly rate is €18,- at one of the 50 touring pitches at Campsite Quattro Stagioni in Sarnano (Macerata). At this campsite you can not only use your CampingCard ACSI for inexpensive camping, you can also use your ACSI Club ID (as an alternative ID). Quiet family campsite at the foot of the mountains near the Sibillini National Park. Spacious pitches with lots of shade. A great place for lovers of peace, nature, hiking, MTB, etc. Very suitable for people with a sportive nature or who want to tour through the mountains by car. Site requires some investment to bring things up to modern standards. Toilet block clean, but now getting old. Roadways narrow and turns tight for large outfits. Very good surroundings, near small town of Sanarno. We were very disappointed with this campsite. It is in a lovely area but the toilet facilities were poor and we would not use it again. The ladies' toilet block had a notice telling us not to drink the hot water although the men's did not have this. Of the four showers in the ladies' only one in there had hot water (warm water always available) but it was not. The shower started tepid and ended up cold. No other hot water elsewhere as far as we could determine. The sinks outside for washing-up and clothes washing were filthy and looked as though it had been months since they had seen a cleaner and some had no water coming from the tap. We felt this site was not up to the usual ACSI high standard. Would you like to book Campsite Quattro Stagioni or request more information? You can do both using the information below or by visiting the campsite's website. A14, exit Civitanova Marche. Motorway to Macerata as far as Sarnano exit. In Sarnano turn right at square (follow main road). Campsite a few km outside Sarnano. CampingCard ACSI will send your information request to "Campsite Quattro Stagioni".